I do. Only the image I remember was much more haunting. It was a photo of a young boy who looked half dazed and half scared. 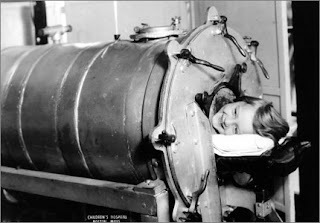 He was trapped in an iron lung. There was no smile on his face. Thanks to an elementary school science textbook, that image is etched in my brain. I thought he was stuck there for the rest of his life. I didn't understand then that it was a temporary (though long-term) supportive measure, until his lungs could breathe again on their own. Though the image haunts me, I am very fortunate. I learned about Poliomyelitis from a textbook. I never experienced it, nor did any of my friends. All we experienced was a sugary gel laced with a life-saving vaccine. When it comes to support groups for parents with autism, I rarely fit in. I don't blame vaccines for the daily challenges my son faces. I try to avoid talking about it, but the discussion inevitably comes up. When it does, I often hammer points too hard when I should probably let them go. I just don't always know when to shut up. But I do know this: Today is not a day to keep quiet. It is a day to shout! To shout in joy for the people of India and to celebrate with those who made it happen. The year was 1985. The number of reported cases of polio in India? 150,000. One hundred, fifty thousand people (that we know of) who contracted a potentially crippling, devastating, life-altering disease. And for each of the next ten years, the lives of 150,000 more people would be in the same jeopardy. For the unfortunate ones whose disease was paralytic or involved their brain or spinal cord, lifelong scars would remain. Today? India has now gone an entire year without a single reported case of polio -- a milestone 27 years in the making. Well done government of India, for stepping up and taking this on. Well done World Health Organization, for teaming up with them to get it done. Well done Global Polio Eradication Initiative, your partnership has been invaluable. And well done Bill & Melinda Gates Foundation -- I appreciate all the work you've done to improve the lives and health of people around the world.